You can stop internetting now, because "Gums" the great white shark is the best thing you'll see today. He might look like the real-life star of a certain fin-filled childhood earworm (make it stop! ), but Gums is no "grandpa shark". Most of us have heard that white shark teeth grow in conveyor belt-style: on average, these animals sport about 24 exposed teeth on their top and lower jaws respectively, and behind those frontal 48, up to five rows of developing replacements are waiting. Even the oldest white sharks tend to have a solid grill. So what's up with ol' toothless here? The shark's other scars and markings offer us a clue. Gums was spotted back in October off Mexico's Guadalupe Island (the haunt of iconic heavyweight "Deep Blue") by diver Doug Vanderby, who managed to film the animal during a cruise with Shark Diving Xperts (SDX). 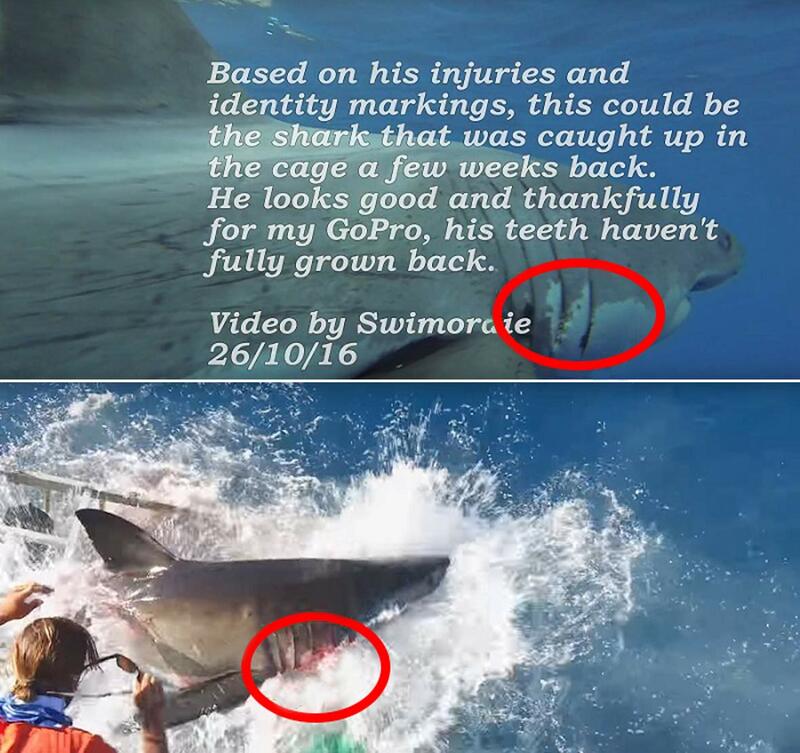 Careful analysis of that footage suggests this may be* the very same shark that had pummelled its way out of a Solmar V dive cage earlier that month. In an interview with TrackingSharks, SDX guide Jimi Partington, who has helped identify over 200 sharks in Guadalupe, notes that markings near the animal's gills line up with those seen on the Solmar individual. "Although I am unable to say with 100 percent certainty that this is the same shark, I feel very confident that it is for a number of reasons," he said. In addition to the gill markings, Partington notes that the leading edge of the animal's dorsal fin, overall size and scratches on its flank all lead him to believe his hunch is correct. Could an incident like this really knock that many tough teeth out of place? It's very possible. Marine ecologist Michelle Jewell, who has done extensive work on white sharks and their relationship to prey, explains that "gummy" sharks aren't all that uncommon. "Shark teeth are quite strong but intentionally precarious," she says. "Any slight trauma to the teeth can knock them out." This helps to ensure that damaged pearly whites are quickly moved out of the way. If you look closely, you can see this in action in this iconic photo (note the renegade tooth near the right side of the frame). However, Jewell also points out clues that suggest we aren't looking at the usual hunting-related wear and tear in the case of Gums. "Many of the shark's front teeth are completely broken, but the roots of the teeth are still in place," she says. "You typically only see broken teeth when they've hit something hard, like a cage, a motor or an unethical seal decoy." 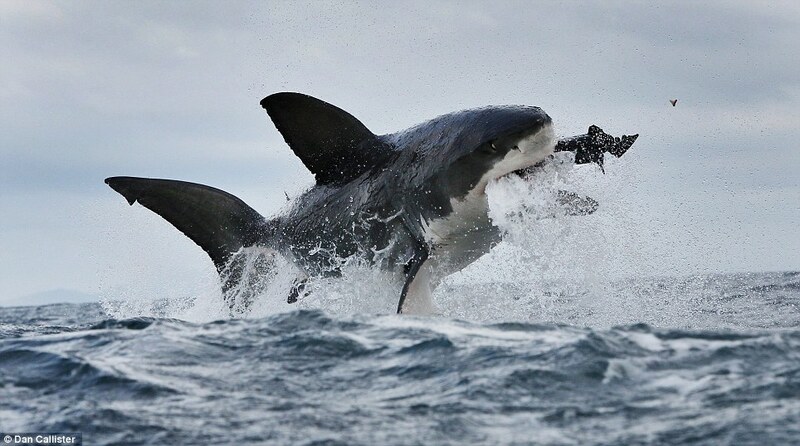 Some commenters have expressed concern about the animal's ability to hunt, but don't fret: white sharks can handle short stints without food, and ol' Gums will be back to his chompy self in no time. In fact, he probably recovered some time ago, since a full dental overhaul typically takes just a few short weeks. *Some Guadalupe divers are less convinced that Gums is the Solmar V shark, and without underwater footage of that individual prior to the incident, it's difficult to say with certainty. In any case, the various experts we've spoken with feel confident that Gums's tooth loss resulted from biting some metal structure – and that he'd soon be on the mend. A young boy restored our faith in humanity this week after he and his father encountered a large great white shark off the coast of Massachusetts. Seeing a baby great white is cool enough, but an all-white one? That's one for the books!